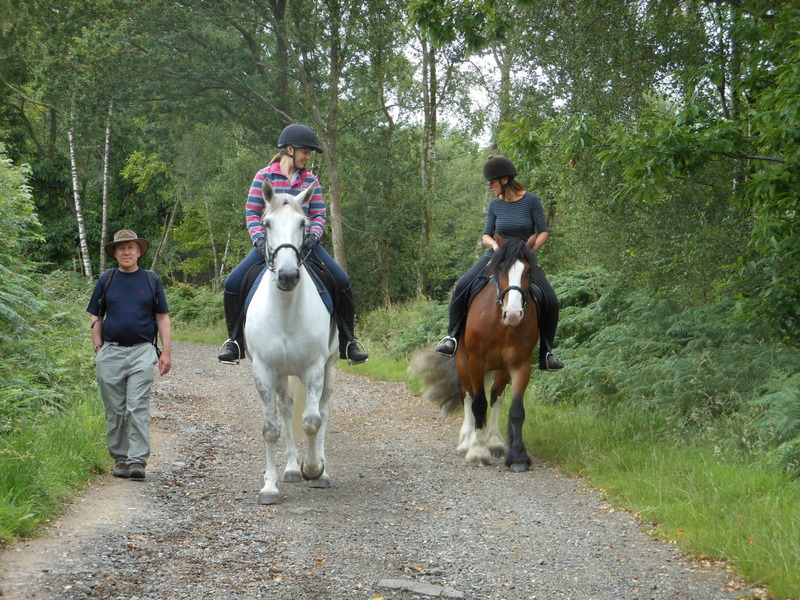 These lovely pics came in over the weekend from Nicky and Dillon who met up with another ex-rehab - Jenny and Buster - for an expedition to Ashdown Forest - plus picnic and photos expertly taken by Nicky's dad (its always great to have ground crew!). Great to see them all making the most of our newly arrived summer and already making friends ahead of the reunion in September. The boys were on good form and seemed to be enjoying themselves too! "This trip has also helped me to note many similarities in all the people I have met since Dillon began his barefoot journey at Rockley. 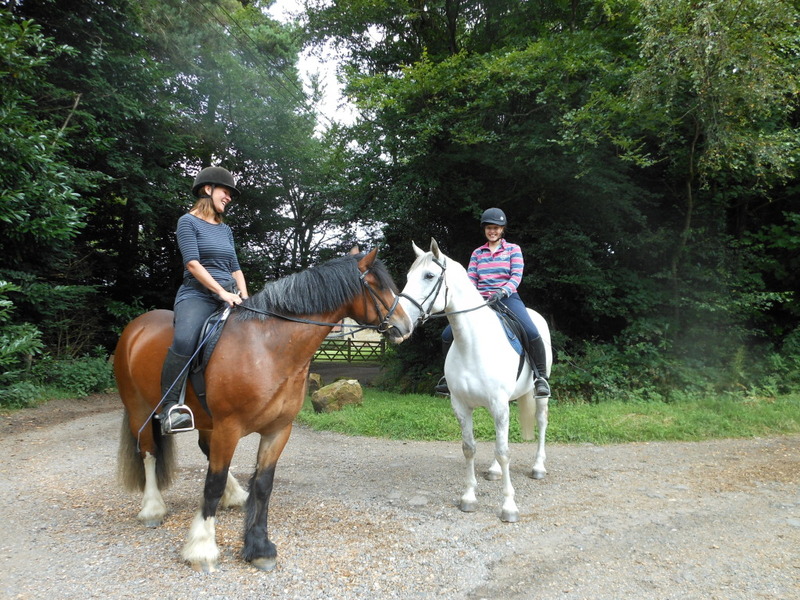 We are all very dedicated to our horses, are generally lovely, friendly, supportive and welcoming and it was great to meet Jenny who is also just like this! We also appear to have quite worrying tendancies for drinking tea, eating biscuits and drinking wine (not all at the same time obviously! 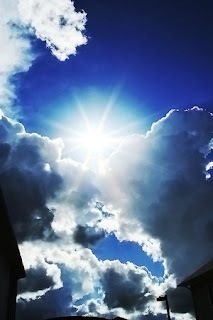 It makes me look forward to RRR 2012 even more!" While the humans were recovering from an insane week of haymaking, the horses - or some of them, at least - were getting the chance to make hay in their own way - let loose on the fields which have been shut up for months. The result of a long and stressful week.. Thanks for all your good wishes - they worked, and it all came right in the end, mostly thanks to a last minute save by Edward and John, who came to bale at very short notice after I'd been let down by the balers I'd booked. That meant a 2.30am finish on Thursday and another late one on Friday, but the weather was incredible and for once rain wasn't a worry. The horses, cattle and sheep are very pleased - they are now allowed back on the hayfields for the first time in months and as you can see there is a new addition to the Rockley crew. Mr Knightley is back for a few weeks while the owner of his yard is off to the US and he has settled straight back in like he'd never been away - its lovely to see him again! 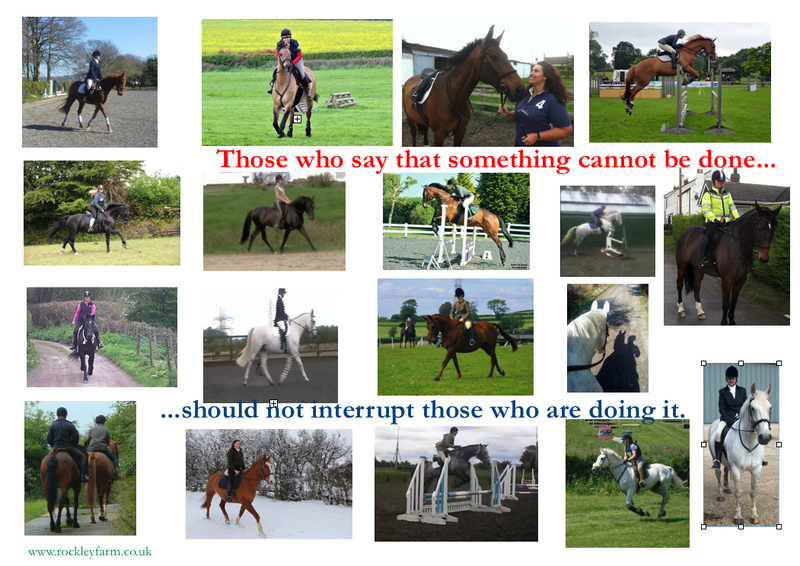 This is for all of you with rehab horses - I've included as many of you as I could but of course there are masses who I just couldn't fit in. I'll add more of you next time! 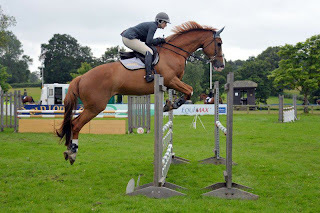 Bryan - jumping at Hickstead! Just came in to give the poor tractor a break - grinding away in the sun on our steep fields is not a recipe for a happy tractor - and found this from Charlotte! Doesn't he look fantastic? Apparently he had a ball and LOVED it! 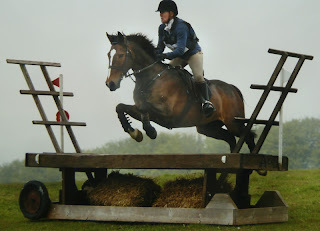 He was jumping a slightly smaller class than last year as he is still learning all about jumping without studs but he is seriously back on form. Amazingly, it is less than 6 months since he came here for rehab following a diagnosis of collateral ligament injury, navicular bone damage and pedal osteitis. Its totally thanks to Charlotte's determination that he came to us, and both Bryan and Charlotte have done us proud! 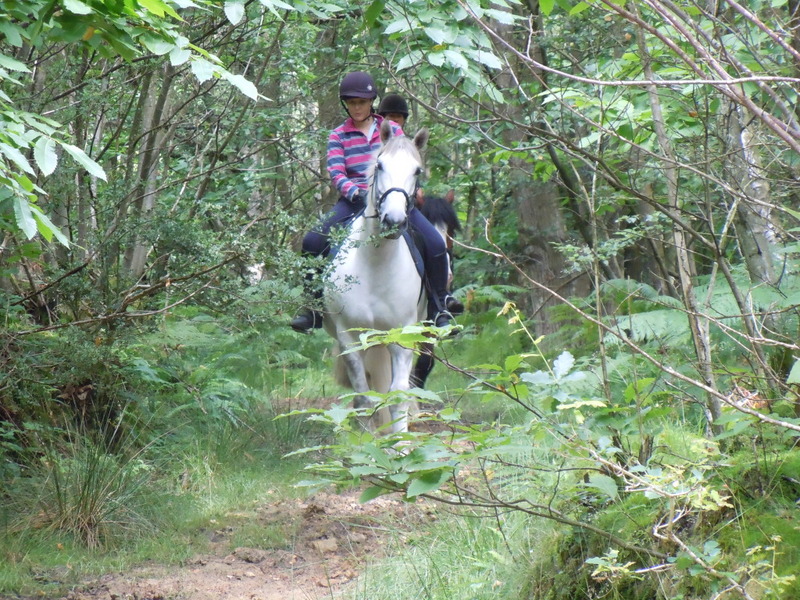 Kudos to the pair of them, and a happy twist to a rather stressful day at Rockley(!) - we are nearly there on the haylage but there is many a slip...so keep fingers crossed for us, please! Please keep everything crossed for us that the forecasters have got it right - I'm in for a few sleepless nights as always till everything is baled and wrapped! Meanwhile, here is a lovely photo of Paddy which Debbie has sent me - nice and clean this time! Paddy went home in February after a somewhat bumpy rehab which included him having colic surgery to remove a lipoma, poor boy. Great to see what a fantastic recovery he has made and well done him and Debbie for coming a very respectable third - with their best score to date - in a local dressage event :-) Brilliant news! Lots of people watched the Panorama investigation on BBC1 this week. It was an interesting programme debunking common myths and assumptions about running and fitness. Guess what - bare feet are more efficient than trainers, sports drinks are a waste of money and (this one did surprise me!) dehydration is less dangerous than drinking too much water/electrolytes. From my point of view, it was interesting seeing the trainers/barefoot discussion finally edging towards the mainstream. There is a link to the iPlayer here, starting at the point where the investigation turned to assessing trainers. Obviously the programme was about human running and fitness but there are some fascinating parallels. 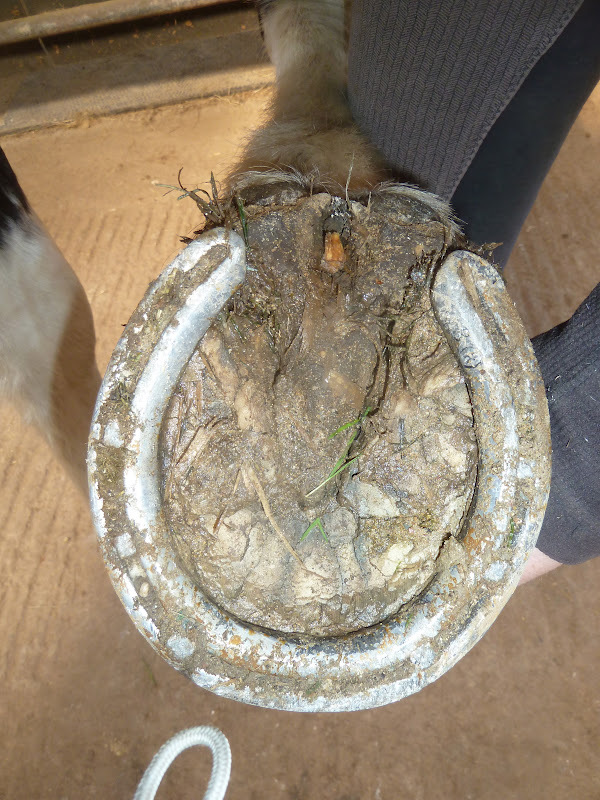 Horses are the only animals - other than humans - who are routinely shod AND whose footfall and landing we try to change with shoes. I've thought for years that our attempts are likely to be counter-productive, and in "Feet First" I included some research into human barefoot/shod injury rates. Guess what, injury rates are lower barefoot and biomechanics improved :-) No big surprise there but very satisfying to see it on BBC at prime time. Even more interesting, the programme highlighted some research done into shoes which are intended to change footfall and provide "support" for compromised feet. 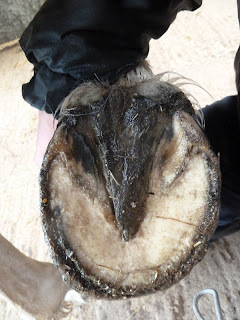 Doesn't this makes you wonder if we should actually be promoting less in the way of remedial farriery and more in the way of overall barefoot hoof health? 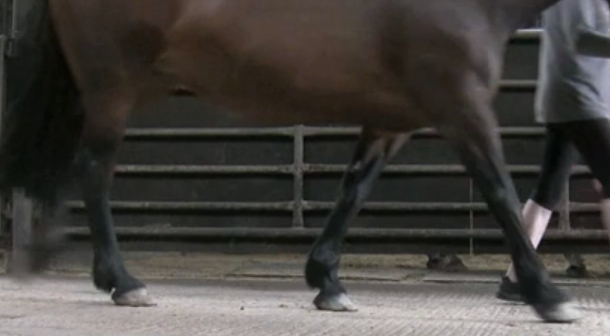 Now there is more and more research being done into human vs barefoot, surely equine research should follow? While we are on the subject of updates, here is one for Rachael, whose horse Dali arrived here 6 weeks ago, and who has been patiently waiting since I posted new footage of him. Here are comparison shots of his RF - his worst foot - from his day of arrival and at 6 weeks. Like Candy, he has shortened his toe without anyone trimming or interfering with him. As his palmar hoof has become stronger the toe has come back of its own volition. You can also see that his hoof growth is making good progress, as the big event line (previously in the top third of his foot and now over halfway down) indicates. Here are his sole shots. His frog wasn't bad before but because he was landing toe first it was weak and his heels were under-run. 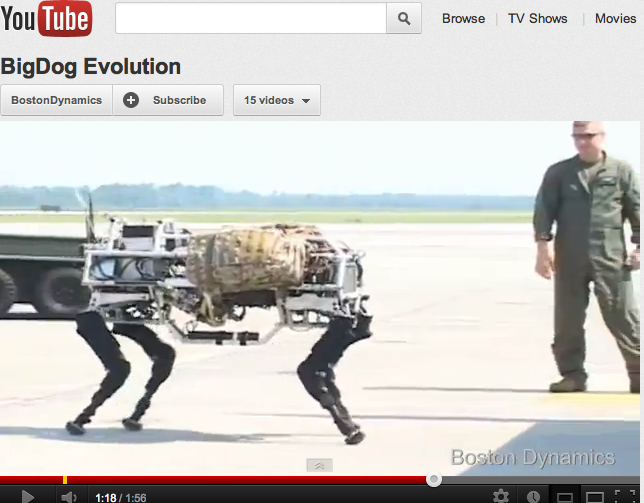 Today his frog is less contracted and his heels are less under-run, though its not as dramatic on his hooves as on some. M/l balance is also changing - more on that in a few moer weeks! The palmar shot shows more clear-cut improvements. Contrasting the original photos (the top pictures) with the lower ones, the difference is obvious: a broader frog, more robust digital cushion and shorter hoof wall. I know Candy's owner, Hannah, is waiting with bated breath for an update, so here it is - though at only just over 2 weeks its a bit early to be showing dramatic improvements :-) Still, I seem to be getting into the habit of 2-3 week updates so here we go! 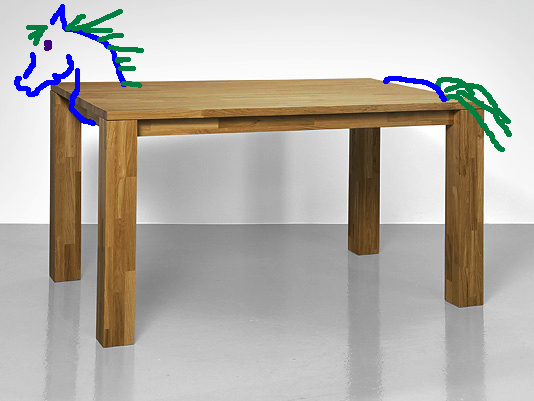 Candy is an elegant little mare who now has her feet firmly under the table and is taking no nonsense from anyone, despite being the smallest horse here. She has quite a magnetic personality and has most of the boys dancing attendance on her - though M is her most faithful admirer. From a foot point of view she has a good range of issues, as I reported when she first arrived, including DDFT splits, impar ligament damage and navicular bone cysts. We've also scanned her on ultrasound since she arrived here, which confirmed the damage on those scans. So here are here feet - this is the worst - LF - on the day she arrived (above) and today (below). Apart from the black areas which are most likely historic sole damage, the areas which jump out are the crushed, folded over heels and distorted frog, which are starting to improve in the lower photo. From the lateral aspect, its interesting to see that her toe is already shortening (again, on arrival in the first photo and today in the lower one). I find with rehab horses that trimming their toe - or "backing it up" - is counter-productive as it tends to overload the palmar hoof before they are ready, but when horses do it in their own time its fantastically effective and a sign that the weak areas of the hoof are getting stronger. There are the beginnings of improvements but clearly lots to do over the next few weeks - still, where Candy leads, the boys will follow! The further adventures of "Dillon with the wedges"
There are few things better than hearing about the successes of rehab horses once they have gone back home. 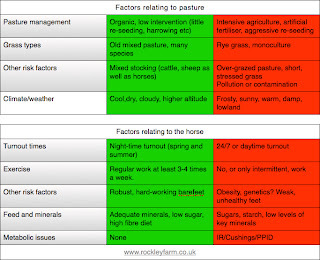 I know only too well that owners face challenges when they take horses home - the biggest, ironically, is working out how to manage their grazing successfully and the next biggest is when well-meaning trimmers and farriers try to "re-balance" their horses' hooves. Nicky, who owns Dillon, faced both of these. When she took him home she worked hard to ensure that keeping him on her livery yard would be successful and, with her yard manager, made a brilliant job of ensuring that Dillon's management was as good as it could possibly be. Like many rehab horses, Dillon's hooves don't look perfectly symmetrical and - like almost all rehab horses - he doesn't benefit from trimmers trying to restructure his hooves to conform with their ideal. 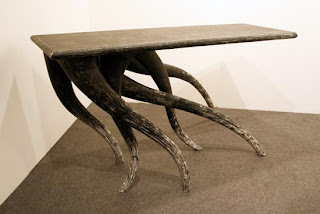 "His feet have grown back exactly how they were before the trim –they look odd to most people but he is sound so he clearly likes them like that. We did our longest hack last week – over 8 miles of roadwork – all the better for his self trimming!" 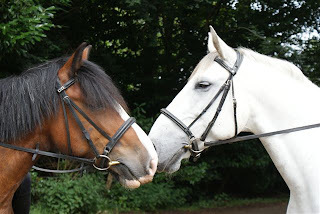 Dillon and Nicky are such a great partnership - and its lovely to be able to report how well they are doing and to be able to add this footage, which I am thrilled about. As Nicky says: "Dillon hasn’t been out to anything resembling a clinic or competition for at least 18 months, nearer two years." 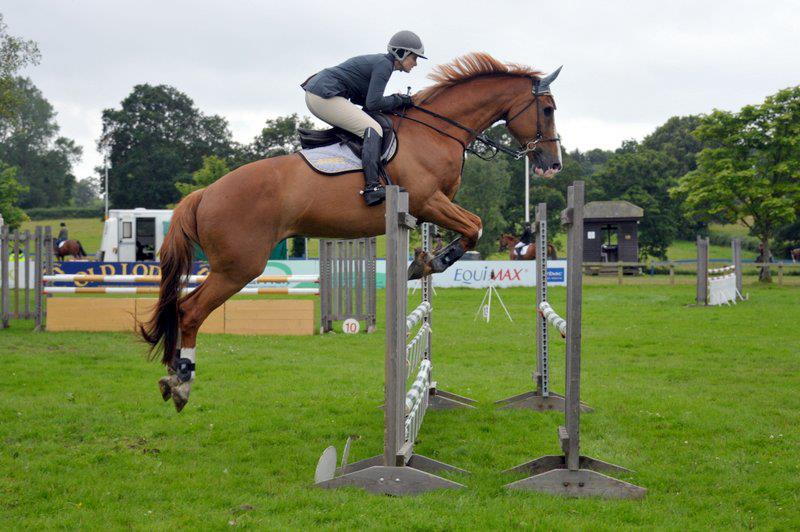 "Despite being critical of myself and how I hold him back I am absolutely delighted at how he behaved and how he went today, I was so proud of him and bits of it felt fantastic, and the judge was very positive about him as a horse and I learnt some good tips. 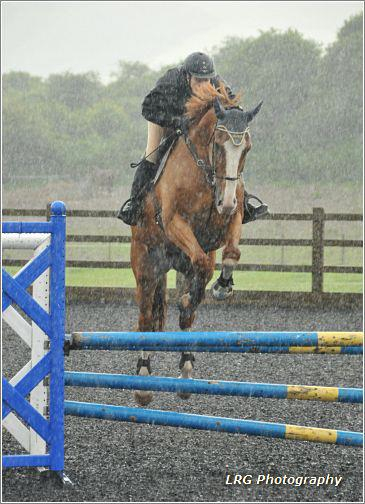 I know I say this a lot but I never dared to dream we would be out doing dressage again, but hopefully with this good experience we will now get him out to a few competitions." M, the scholarship boy, has now been here just over 5 weeks. He arrived, as regular blog readers know, with a slew of hoof problems from the usual palmar hoof problems ("navicular", toe first landing and therefore presumed ligament and tendon damage) plus thin soles, long toes and under-run heels with the added fun of an old hock fracture LH, unexplained lameness RH and historically bad cracks. The latter at least are ancient history, since he came out of shoes a few months before he arrived here. So all we have to do is try and improve the other stuff...! Here is his RF the day he arrived. 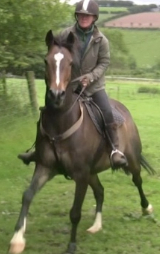 His owner had made big improvements to his diet and he has also had treatment for ulcers - which as an ex-racehorse are almost a given for him. So a lot of the good groundwork was already in place before he landed at Rockley. 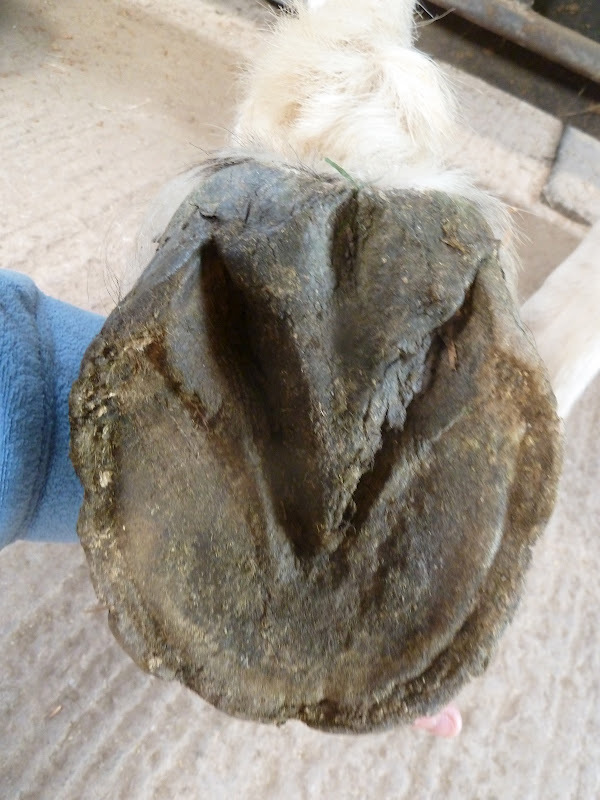 Here is the same foot 5 weeks later - gosh, look, its a lot wetter for a start...More importantly if you look at the top of the hoof there is a steep new angle of hoof growth and there is more development at the back of his foot. Of course, M has a long way to go. 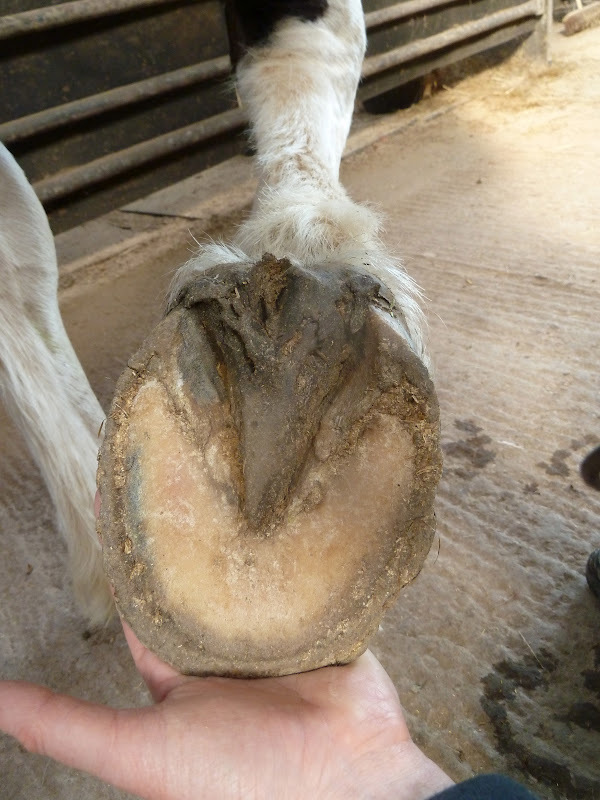 He's at an early stage but its clear he is both capable of growing - and trying to grow - a much better hoof capsule. Here is his RF over 5 weeks - from day one, which you've seen before...The key points are the frog, heel buttress and bars. When I first experimented with taking the shoes off my horses (and like many owners I tried it because there were no other options left) I honestly thought that going barefoot (and of course a "barefoot trim") was the answer. Taking shoes off seemed to be the last piece of the jigsaw - but how wrong I was! 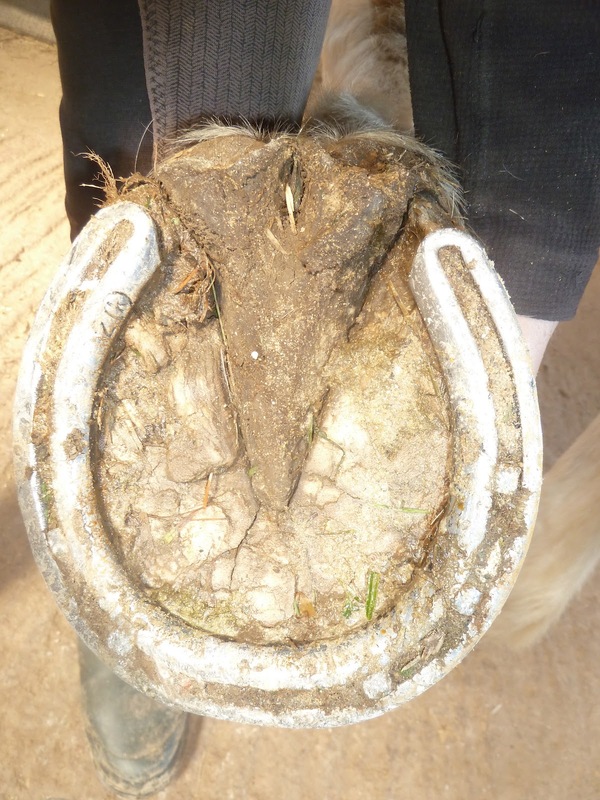 Over the years its become increasingly common - as barefoot has become more popular - for people to email me or post on forums a comment like: "My horse has been barefoot for x months and its still not right" or "I tried barefoot but it was no good for my horse". Like me all those years ago, these people thought barefoot worked like a magic wand - you take the shoes off and bingo, everything sorts itself out. 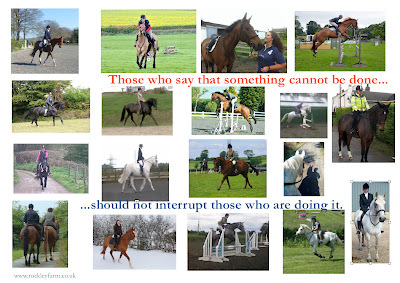 Taking a horse barefoot isn't the last piece of the jigsaw, its just the tip of the iceberg. Once shoes are off horses' feet can (and often do) change radically - but its not inevitable that they will do so. The foundation for any successful barefoot horse is good nutrition and this is one area where we've made huge progress. At the time "Feet First" came out, most people thought that "barefoot" was a type of trim. The book was an attempt to give owners a more accurate picture of what factors influence hoof health and practical ideas on how to improve the health of their own horses' feet. Many were initially sceptical about how big an impact diet has on feet, but trial and error - and seeing the effect on their own horses - made most owners well aware of its importance. For sure, if you ignore nutrition (unless you are very, very lucky) you will struggle with soundness. I posted about the some of the nutritional "challenges" here and generally the more "red" factors you have to deal with, the more careful you need to be. However, even nutrition isn't the last piece of the puzzle. Right from the early years I have had rehab horses who arrived out of shoes but with ongoing lameness problems. Often vets and even owners say something like "Its already barefoot and its still lame so how is what you do any different?" The common denominator among the horses who arrive here - whether shod or barefoot - is that their biomechanics are compromised. 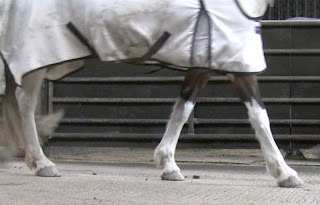 Generally, horses are landing toe first and/or have poor medio-lateral balance; naturally some have nutritional/metabolic issues too, which complicate things further, but the biomechanical problems are common to all of them and its these that have led to the "navicular", DDFT and other injuries that are then diagnosed. The hype about "barefoot" has grown a lot in the last few years and there are still people (like the ones quoted above) who think its all about taking the shoes off. 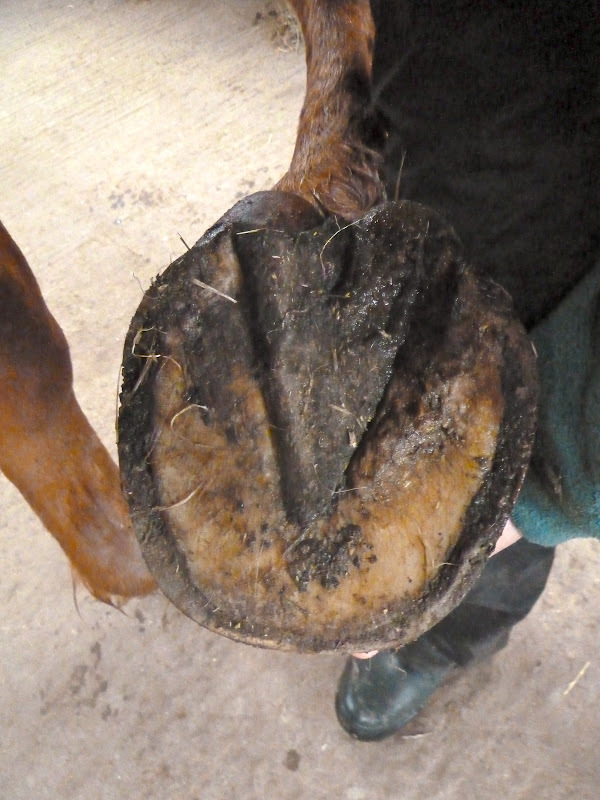 They are then puzzled when the same lameness persists out of shoes - but the answer generally is that the biomechanical problems have not been resolved and so the damage and injuries persist. Someone called me only the other day about their 4 year old horse which went lame in shoes with a "navicular" diagnosis. He had improved somewhat after she had taken the shoes off but was far from 100%. Her words were "You hear all these stories about barefoot successes so I don't know why its not working for my horse." 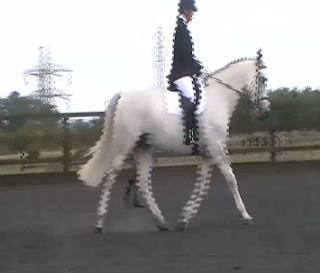 I haven't seen the horse, but since she had already sorted out his nutrition, its most likely that the horse's biomechanics were still compromised - the way he was moving was still causing stress or injury. 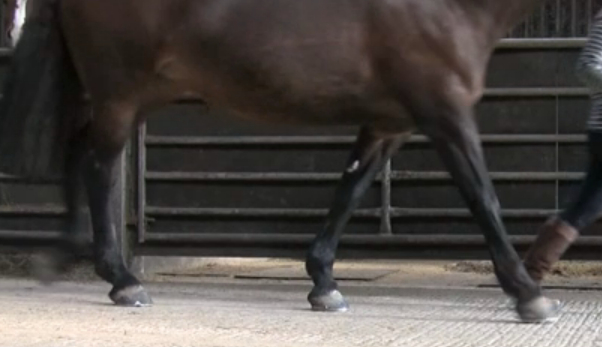 Believe it or not, its possible for barefoot horses to have biomechanical issues, just as its possible for shod horses to be perfectly sound. It all depends on how the horse is loading his feet and whether he is landing correctly. That in turn depends on the strength of the horse's hooves and how he is affected by trimming or shoeing. So what's the point of this post? Its just a reminder...Don't lose sight of the whole horse. Its a very complex puzzle and there is no one aspect which will give you all the answers. Nutrition is vital - but its one part of the puzzle. Feet are vital - but they are one part of the puzzle. Movement is vital - but its one part of the puzzle. Good biomechanics are vital - but they are one part of the puzzle. Fair and correct training is vital - but its one part of the puzzle. 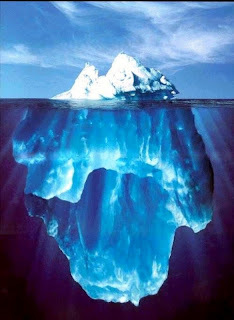 A good environment is vital - but its one part of the puzzle. 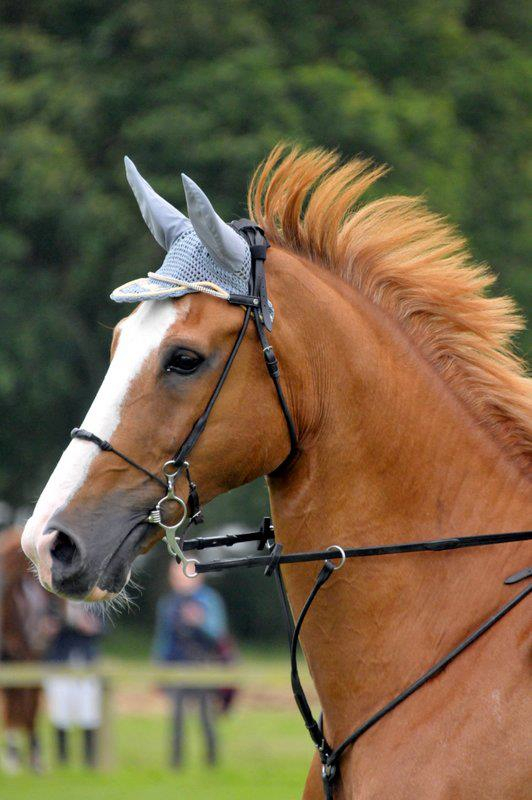 Well-fitting tack is vital - but its one part of the puzzle. You get the idea! What you will find is that if these aspects are individually right, then you will gradually get a "virtuous circle" of improvements - in health, in behaviour, in ridden work. What is less successful (though its easier in the short term especially if you are confident in one field and not in the others) is to focus on one aspect to the exclusion of the others. A magic wand would be much simpler - if only life were like that! "We even managed to cover our entry fees and win our first rosette as a bona fide barefoot competition horse. " Woo hoo! Fab news indeed - so very pleased and a credit to Charlotte's hard work and dedication! 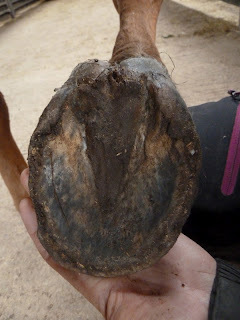 Here are some interesting shots for the true hoof nerds amongst you...Sole shots for Roo, who has been here since 11th May. 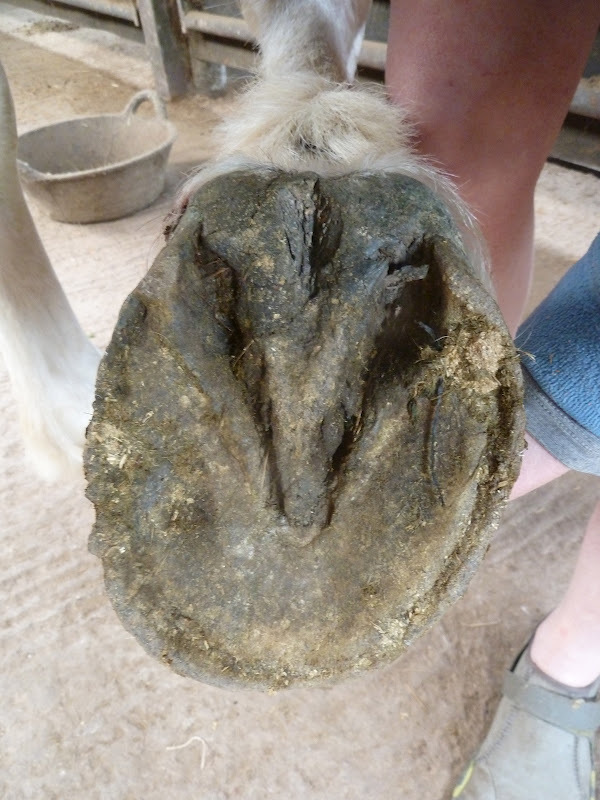 I said earlier this week that the best way to assess whether a hoof is balanced is to look at it from the sole - since that's where it meets the ground and where loading is defined. Here is Roo in shoes - her LF which was her better foot. 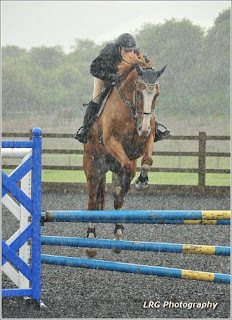 Here she is on 27th May - so just over 2 weeks later (and look - it wasn't raining!). You get a better view of the heels, which are slightly under-run and a better view of the medio-lateral balance. If you draw an imaginary line top to bottom down the centre of the frog and compare the 2 sides of the foot, the lateral side (on the left here) is bigger and suggests she was loading that side more than the medial side. By 24th June - about 6 weeks after she arrived - the heels are looking much better though there is still a lot of change happening on the medial side particularly. Now a line down the frog would show a more balanced foot, though still more loaded on the lateral side. Today (and of course its raining as it has been all week...) both heels are better still - though they will improve again over the next few weeks. The bars are straighter, the frog no longer distorted and the foot looks as if its medio-lateral balance is now fairly good. This foot was worse to start with and so is not yet in perfect balance but I hope you can see that (as with the LF) things are heading in the right direction. Its interesting that on this foot she was overloading medially, which is unusual. The change in frog orientation is another giveaway, of course. These hooves are a good illustration of what I was talking about a few days ago because none of these changes can be achieved by trimming. 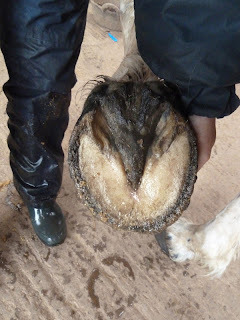 These changes are the result of better growth coming down, and changes from within the hoof capsule - they are a response to better loading and better stimulus and can't be achieved with a rasp or knife. I tried to add this earlier but Vimeo is not a happy bunny at the moment so I've switched this back to Youtube for now...Lots of you will have seen this before but I've added some more footage on surfaces and its a fun reminder of how well feet trimmed "by celery" deal with surfaces. Keen-eyed blog readers will notice that this was from last summer, when I'd just started riding Felix with no bridle - lots of fun! Some of you may remember a post I did a while back about hoof balance, in response to a comment that "a horse's leg is like a table". If there is only one thing you should remember about balancing hooves its that your intentions are irrelevant. No-one, whether farrier, trimmer or owner sets out intending to do anything but the best possible job when they trim a horse. Unfortunately good intentions are no way of ensuring a safe, effective trim. 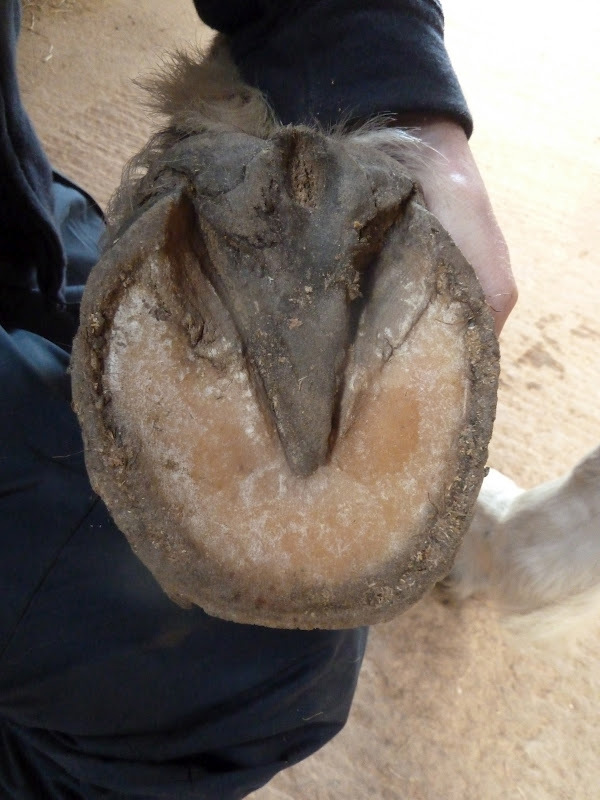 There are lots of factors to take into account when assessing hoof balance - and how hooves look from the top is perhaps one of the least useful. What really should determine whether a hoof is balanced is how it is loading and - anatomically - whether it can be used in the most biomechanically efficient way. 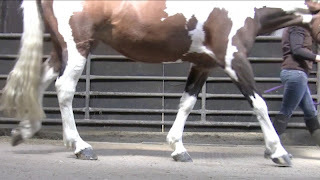 While we can get a hint at some of the factors in play by watching the horse move, studying how its hooves land and looking at its conformation, that in itself is only superficial. The only way of guaranteeing that the balance is right is to have detailed knowledge of every injury that the limb - and indeed the rest of the horse - have undergone. To react and allow for every stress and compensation that the limb - and the whole horse - have to make as a result. To allow for micro-trauma to tendons, ligaments and muscles that you can't see and have no way of monitoring on a regular basis. 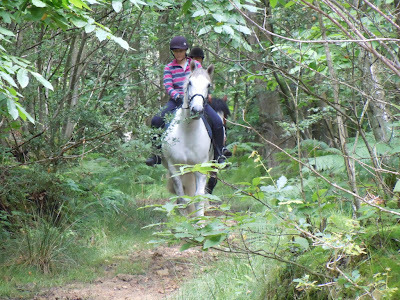 To factor in a response to the terrain the horse lives and works on and to adjust growth so that is is appropriate for the level of stimulus the horse is getting. 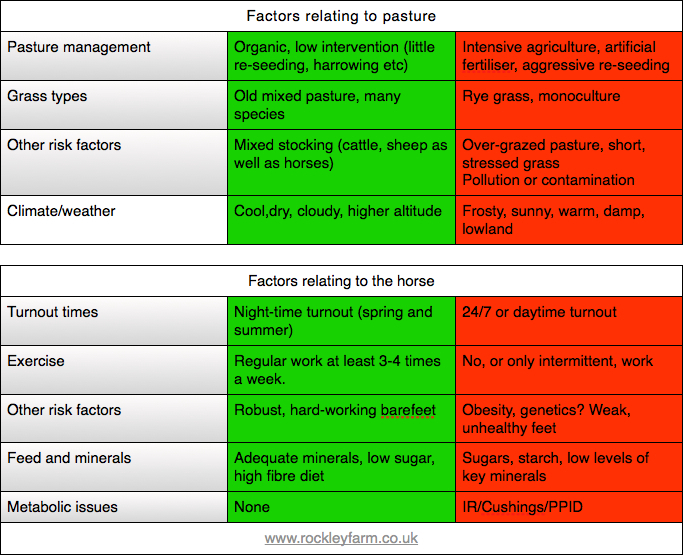 Don't forget that all of these factors will change from day to day, week to week, season to season - and you begin to get an inkling of why balancing hooves is an incredibly complex job. 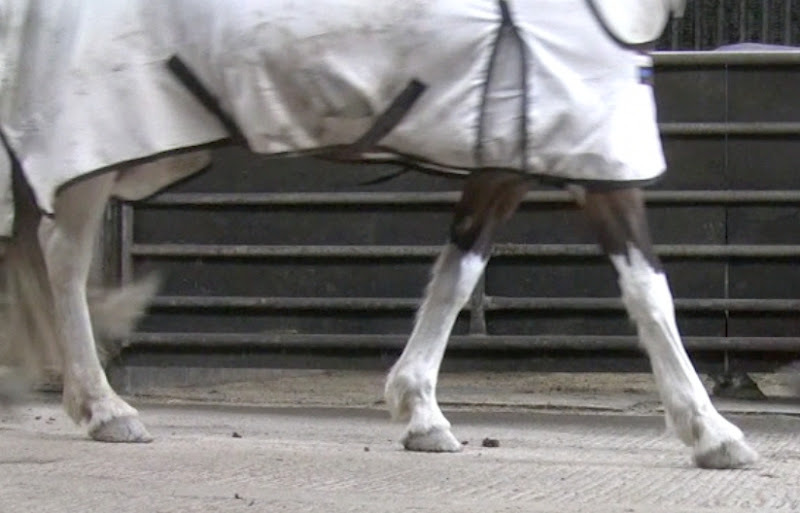 I'm really pleased with how she has progressed, from a clunky, sliding landing (especially on RF and LH) to first a tentative heel first landing with a shortened stride and now - as her hooves are stronger, better able to shock absorb and loading properly - a confident correct landing with a better stride length. This is for Rachael - obviously Dali at 4 weeks is not so far advanced as Eva but all the same he has made some progress. Initially his landing is poor on 3 out of 4 feet - the only "good" one is the RH - but on the more recent footage his hinds are much better and even his RF (his worst foot) is starting to engage properly. He of course has a long way to go but its nice to see things start to re-balance. Finally, Roo. I must admit I got a surprise when I looked at her new footage. When she arrived we filmed her, as always, and her dorso-palmar landing (heel/toe) didn't appear too bad - although she was tipping onto the medial side particularly of her RF. When I added the most recent footage from yesterday, though, I was surprised by how much more solid and comfortable her landing looks. She has always been a very nice moving mare but now she really looks as if she is capable of covering the ground and - again -a better stride length.